It might be said that a birder is only as good as his or her field guide. 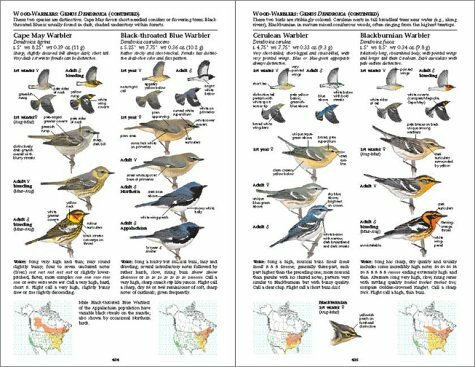 While there’s far more to it than that, we all start somewhere, and a good well-documented field guide is crucial to any birder’s success. Here I present a list of field guides that I’ve used, so they’re “field tested,” so to speak. As I believe you can never have too many field guides (that’s like saying you have too many birds on your Life List…what’s too many anyway? ), some of these guides will overlap in their coverage areas. And because every good birder needs time to unwind and collect his or her thoughts, I’ve included reviews of some books I’ve read with a birder or Nature-lover in mind. Once again, this list is in no way complete, and I welcome any comments on books or guides that I should include here. 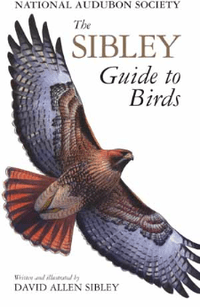 At some point in any North American birder’s career, they are confronted with this one question: “Sibley or Peterson?” I’ve thrown my lot in with the Sibley gang, so I’ll start this review list with my favorite, and well-worn, field guide, The Sibley Guide to Birds. Written by David Allen Sibley, the guide breaks down the species of North America by families, and each species is given a well-drawn color plate illuminating key field markers. I personally find illustrated guides to be far more useful in the field than photographic ones, as photos only show you the field markers of a particular individual bird, whereas illustrations give you a general “sense” of the bird as a species. Each color plate comes with a small range map, with color codes to differentiate between migration routes, breeding grounds, residents, and overwintering ranges. For some species these maps are too small or give the wrong impression of the actual range; some maps are out-of-date and could do well with an update. The book was released in October 2000, so it can be considered outdated. However, the species accounts and illustrations are top-notch and more than make up for the unreliability of certain range maps. This book has also been republished in Eastern and Western North America editions, focusing on the species common to the two regions. The one fault that I find with this book, and it is one that I have found with most North American (i.e. United States) field guides is that it neglects to mention any species of the Hawaiian Islands. The book is tailored to American readers, but it completely misses one of the 50 states. There are separate guides that cover the Hawaiian Islands specifically, but I find it odd that a field guide for North America and the United States in particular excludes Hawaii but makes a point to include many of the Eurasian overshoots that occur in Alaska, for the sole reason that Hawaii is not connected to “mainland” North America. I would like to see future editions of this book include the Hawaiian species, as many of these are endemic to North America and should be included in a North American field guide. A great companion to The Sibley Guide to Birds, The Sibley Guide to Bird Life & Behavior provides much greater detail into the “personal lives” of our feathered friends. The guide covers many behavioral characteristics of birds as families, including more specific details of key species or unusual behaviors when applicable. There is loads of information on nesting behaviors, migration habits, courtship, and more, and the first chapters also include specifics on bird taxonomy, anatomy, and habitat definitions. More of a reference book than a field guide, it provides information more fitting of the amateur ornithologist than the backyard birder, though it is written in simple language and nice prose, so it can appeal to those with just a passing interest in birds as well. The book contains many illustrations from The Sibley Guide to Birds, but also many other illustrations specific only to this book. It’s not really a fault per se, but although there is plenty of information concerning the bird families covered in the book, I would like to see more species-specific information. However, a book containing that amount of information for each species in North America would have to be several volumes in length, so for the size and scope of the book, I feel it does a terrific job of introducing the reader to the more intimate details of birds’ lives. Gulls. For most birders, gulls cause heart palpitations and blurred vision, soul-sucking flashbacks to standing on a frozen seashore in winter, or traipsing through a city’s worth of garbage at a landfill. Beachcombers call them “rats with wings” (a more fitting description of bats, really), but you don’t need to live near the ocean to find gulls. These feelings of ill-will are caused by their seemingly infinite variation molt patterns, not to mention endless combinations of hybridization. Indeed, it is often next to impossible to 100% identify a single “strange-looking” gull, except for perhaps the most knowledgeable and experienced of experts. That’s where The Gulls of the Americas comes to the rescue. Written by Stephen N. G. Howell, this hefty book can hardly be called a “field guide.” At 500 pages, containing some 1,100 photographs covering the 36 species and 14 probable hybrids found in North and South America, this book has enough weight that, as my favorite comedian Lewis Black once said, “if a puma came at me, I could kill it!” This book is hands down the Encyclopaedia Britannica of gull identification, and is quite possibly the leading authoritative book for IDing gulls in the Americas. Each species is painstakingly documented in crisp photographs, giving a thorough representation of multiple plumage and molt variations. Many of the photos show the gulls together with other species, allowing you to look for field markers yourself and learn to identify gulls within large groups, rather than solely on their own. I find this comparison identification method to be quite useful with gulls, as they do tend to congregate together in mixed-species roosts. The second half of the book contains detailed life histories of each of the species mentioned in the book. These pages further document the different molt stages of each species, and provide other useful information on nailing that ID. The downside of this book is two-fold, in my opinion. One is the size: it’s simply too big and too heavy to carry around with you. It serves as an excellent reference guide for comparing notes and photos to later, but may fail you out in the field as you struggle to remember the varying shades of grey on the mantle of a particular gull. The second fault is that this is a photographic guide, not an illustrated one. However, the sheer number of photographs, covering multiple stages of molt and ages, may overcome this weakness. Perhaps gulls are that special case, where photographs of hundreds of individuals paint a better picture of the species as a whole than just a single color plate giving a few vague impressions. 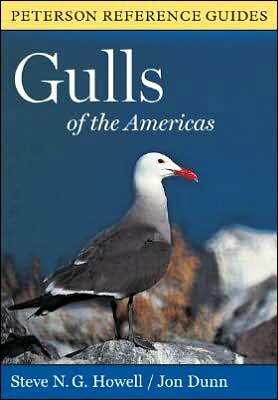 Overall, The Guide to the Gulls of the Americas is the definite authority on the subject of gull identification. If you venture down that road of gull identification, and the inevitable frustration it will entail, this reference is invaluable. The average person thinks of birds only in terms of the small brown ones that hop around in their backyards, or come to their feeders. Some may think of exotic rainforests with their toucans and parrots. Maybe even a few consider the giants of the bird world: the ostriches, rheas, emus, and cassowaries. But very few ever think of the open ocean as a hotspot for birds. In truth, most landlocked birders rarely even consider the ocean beyond the shorelines and coasts. Derek Onley and Paul Scofield took on the task of bringing the world’s least understood birds into the light with their impressive and comprehensive Albatrosses, Petrels, and Shearwaters of the World. As these species aren’t bound by the borders and obstacles of land birds, the oceanic bird species (or pelagics in birder lingo) can appear almost anywhere in the world, and many of their breeding and courtship behaviors, life histories, and basic existences, are poorly understood. And from a birder’s perspective, a lot of them simply look the same. The field guide (water guide?) is comprehensive but small enough to bring along on the boat. The color plates are well drawn and display similar and related species on the same page for easy comparison. The guide also highlights the subtle field markers that help differentiate one drab grey and white shearwater from the other, often subtle things that can easily be missed to the uneducated eye. There are even color plates that compare subspecies that differ from one another sufficiently to be confused as separate species. After the exhaustive section of color plates, there is an equally well-researched and well-presented life history, complete with range maps, which gives as much information on these species as is known at the time. My only regret is that I have not had the opportunity to use this guide often enough. Pelagic birding can be intensely rewarding or a dismal failure; this is often dependent on nothing more than the weather and a bit of luck. It can also be an expensive endeavor, and is not for anyone with a weak stomach. Your individual use of this book will vary depending on your own situation, but Albatrosses, Petrels, and Shearwaters of the World is a worthy addition to any field guide library. I’m new to the international birding scene, but I learned enough in North America to know that you don’t enter a new continent and expect to rake in the lifers without doing your homework first. A Field Guide to the Birds of Korea, written by Lee Woo-Shin, Koo Tae-Hoe, and Park Jin-Young, and translated by Desmond Allen, is the only English-language field guide specific to the Korean peninsula. It contains 300 pages of beautifully illustrated color plates of the majority of bird species that breed, overwinter, or migrate through the Korean peninsula. Each plate has a short description of the bird, along with color-coded range maps. This book is definitely a field guide, whose purpose is to show you how to identify what you see. While it does exceedingly well in this regard, it is lacking somewhat in the species descriptions, namely in the descriptions of habitat and song; some species have no description of either. The book was published in 2000, and as such requires a bit of updating to include many subsequent species splits and name changes, which can make it confusing in knowing what you’re actually seeing in the field. The book also leaves out a few exceptional records, such as South Polar Skua, which is casually observed on the Yellow Sea near Eocheong Island. However, being the only English-language guide for the region, it is definitely a must-have guide for birding the Korean peninsula. A solid companion and cross-reference for A Field Guide to the Birds of Korea, Birds of East Asia by Mark Brazil is an expansive collection of color plates for nearly 250 species throughout eastern Asia, including China, Taiwan, Korea, Japan, and eastern Russia. At 528 pages, it’s a bit on the bulky side, so I use it primarily as a cross-reference with the more portable Field Guide. The plates are highly detailed and provide comparisons with several subspecies (where they occur), as well as comprehensive species accounts and range maps. This book is a bit more up-to-date, and includes species that are missing from A Field Guide, such as the Himalayan owl (split from the Ural owl). I particularly like the subspecies accounts, which detail where they occur and in many cases provided colored plates to show what they look like compared to one another. As genetic profiling allows scientists to better understand what makes a species unique, today’s subspecies are tomorrow’s full species, so knowing that you’ve seen two or three subspecies can make the difference between counting a future species and having to plan another trip to see it again. It’s size makes it unwieldy in the field, and as it follows a different taxonomic profile than Clements (which I am used to in North America), some of the species names and binomials will be different than you may expect. The book also switches the descriptions of the Eastern and Western Yellow Wagtails, which is something to watch out for. Nevertheless, the book is thorough and complete in its accounts, and covers a broad enough area to allow you to travel to several east Asian countries and use only one guide. This is by far one of my favorite bird-related reads. It chronicles the life of Dr. Richard Koeppel, whose obsession with birds led him to become one of only a handful of humans to see over 7,000 bird species. Written by his son, Dan Koeppel, the book contains rich prose detailing the life and times of Dr. Koeppel, from his early beginnings growing up in Kew Gardens in Queens, to his military service in Europe, and finally to his frenzied pursuit of “every bird on Earth.” A combination biography, travelogue, and history book, this book delves deeper than ever into what makes humans go to extreme lengths just to see a bird. Dr. Richard Koeppel sadly passed away in August 2012, after a prolonged battle with cancer. To this day he is still ranked among the top ten Big Listers. Birders have been captivated by the Ivory-billed Woodpecker since its disappearance in the mid-1900s. Despite numerous reports of sightings through the later half of the twentieth century, the legendary woodpecker was thought to be extinct. But not by Tim Gallagher, editor-in-chief of Cornell University’s Living Bird publication. 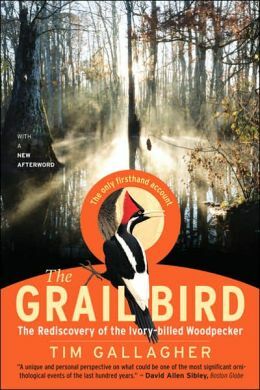 Written by Gallagher, it describes his desperate search for the ivory-bill, following up clues and reports from the Big Thicket country in Texas to the Atchafalaya Swamp in Louisiana. Providing detailed descriptions of the landscapes, as well as a thorough history of the ivory-bill and its dwindling habitat, the book brings the reader along for the ride, right up to the fateful rediscovery of this long-lost bird. Do you think the Ivory-billed Woodpecker still exists? Read this book and decide for yourself. 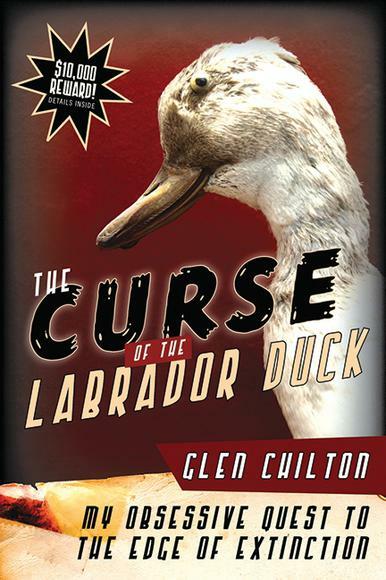 For a lighter read, check out Glen Chilton’s The Curse of the Labrador Duck. The story centers on one man’s obsessive quest to see and measure every specimen of the extinct Labrador duck. Extinct since the late 1800s, very little is know about this duck’s life history, and all that remains are 55 stuffed specimens and 9 eggs. Although this seems like a very dull topic, Chilton’s sense of humor and storytelling prowess turn it into quite the mis-adventure. The book gives plenty of history and detailed descriptions of Chilton’s travels. However, it may leave the reader wanting more. What information did he glean from measuring all those stuffed birds? Did he collect any DNA, or other information that may explain why the species went extinct, or possibly allow us to one day recreate it? For a look on the lighter, funnier side of the obsessive quality of birds, see if you can discover The Curse of the Labrador Duck.